We love to laugh. Sometimes, humour comes from the most unexpected places. For instance, those overheard conversations between fractious couples in supermarkets, could be us, or the innocent comments of children and of course, the snippets gleaned when passing someone in the street that can make one giggle out loud. It was the latter type which had me giggling today. We had had a particularly delightful walk, despite the steady drizzle and the wind that whipped our faces. We strolled through the town, stopping for a browse in FatFace and then a mandatory coffee in the Coffee shop before walking up to the newly refurbished Fowey Harbour Hotel, where we chatted to a delightful lady who took time out from her meeting to tell us all about the hotel which we had not seen in its newly refurbished guise. 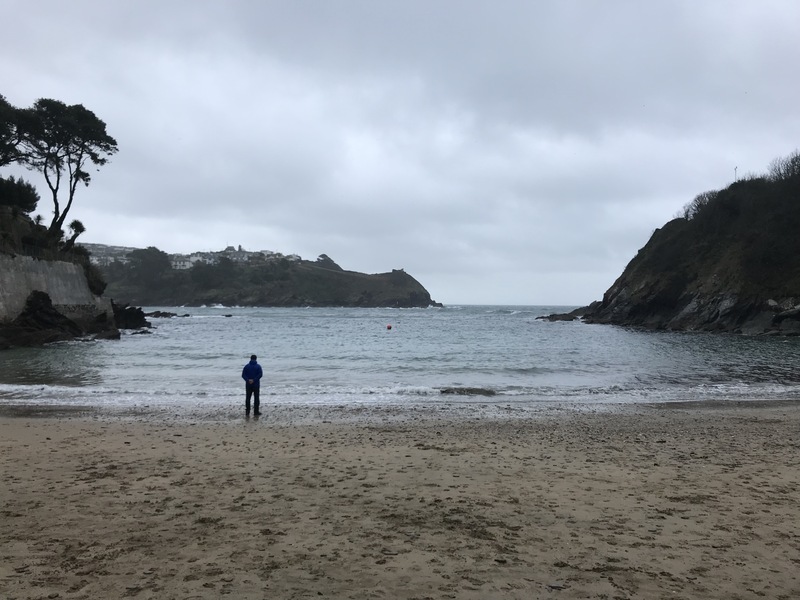 (It is worth a trip – absolutely lovely) Leaving there, we headed down to our favourite beach, Ready Money Cove – always more beautiful in winter with its rugged rocks and rough sea. Out of season, the beach is dog-friendly and dogs lolloped along the sand and played in the waves. We were content to just stand and stare and take the obligatory photo. Climbing back up to town, we felt refreshed and thankful that we had had the good sense to buy a house here, back in 2009…almost ten years ago now! January is not the busiest time of the year but even so, there were plenty of people meandering along the High Street as we made our way home. This tickled me at any rate! Hi Debbie – love that … I can believe you’d be giggling happily – these are fun memories to have – they keep us amused for a few days. Wonderful decision to buy that house … the Fowey area isn’t one I know well – but love, love Cornwall … further west mostly – though used to visit Trenarren quite often to see a great couple, who were friends of my parents. Hilary, I agree there are many beautiful places in Cornwall worthy of a visit and it varies from coast to coast. Conversations are the same the world over though LOL! I love to laugh and those street conversations are often great for causing a chuckle or two. I do not know UK very well so can not really comment but your pictures are just lovely to enjoy. Thank you. Makes me want to come back and check out more spots. I do think some folks are that petty – indeed We definitely have a dog walker who leaves baggies in people’s yards and driveways. The bags are always the same. Also one neighbor often leaves his baggie while he finishes the walk to the elementary school, but then retrieves it on the way home.